Took my first road trip on my own bike last weekend! 800 miles in two days. Woot! What a beautiful weekend for a ride. We headed out Saturday morning. It was a very chilly 52 degrees when we hit the road at 6:30 am. I had 2 shirts and 2 sweatshirts on under my mc jacket, jeans + mc pants, gloves, and a hood up under my helmet. Left home in east-central Iowa and headed south, mostly meandering on two-lane highways, making a quick stop for breakfast, a break along the banks of the Des Moines river, then down into Missouri. We did not have a specific destination, but wanted to get as far south as we could while enjoying the roads/scenery along the way. Stopped often to check the map and pick our next section of roads to explore. Stopped in Memphis for gas (found a fun road, Cty Rd TT, where my bike hit 1000 miles on the OD so I did a little 1K dance ), Paris for lunch, and in Florida to see the home where Samuel Clemens was born. We decided we were on a world-tour, Missouri style. LOL! 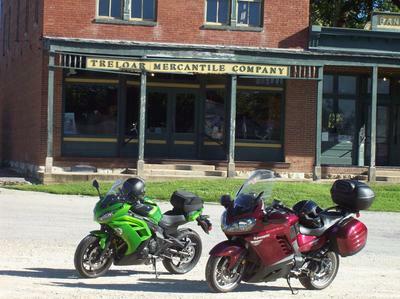 We got to Mexico by 4:30 and decided we would make it to Jefferson City that day. It was a little warmer starting out on Sunday, but still began with all the layers on. We hugged the Missouri River this morning on Hwy 94. That’s a nice road! We enjoyed it so much that we kept to it all the way to I-64 just west of St. Louis. Stopped for lunch in Moscow Mills (continuing our international tour, lol! ), then trotted over to Hwy W. “W” is for wonderful! 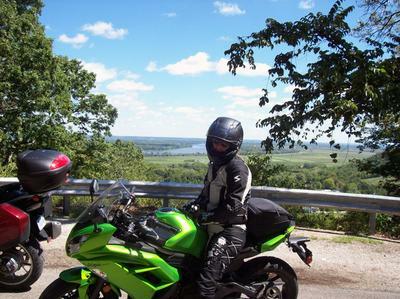 Hills, curves, and scenery…it was a great ride! Made it to Hwy 79 at Clarksville, a pretty little stop on the Mississippi, then back on the road only to get stung by a bee! Grrr! That sucker found the only exposed skin…on my neck! 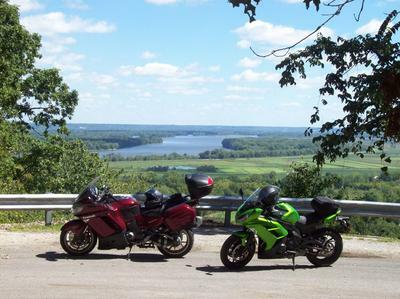 After that little “impromptu” stop, we continued on through Louisiana and on up through Hannibal for some beautiful views of the Mississippi. A few miles on the 4-lane Hwy 61, then it was onto another fun little roller-coaster road, Hwy 81. Took a little break in Kohoka, where I turned to Steve and declared, “this is MY kind of roller-coaster ride!” A few more 2-laners over to Hwy 218, a short stop for ice cream, and we were on the road home. I’ve come a long way from my “first week and a half” at the beginning of August! Comments for My First Road Trip! Thanks ladies! I am so glad I came across this website. It's really wonderful to be able to tell my story to other women. I also post occasionally on a different site. It is very interesting to see the different responses you get from men as you do from women! Men like to tell you what to do...like to "fix" things. Women encourage and support. It's our nuturing nature, I guess!!! Not that I don't appreciate the input from the boys, but it's nice to have a place to talk to like-minded gals! Looks like you had an awesome time. Nice pictures. I love all the "worldly" place names on your trip Paris, Mexico, etc. 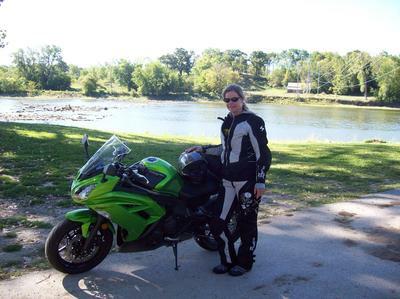 Donna, love your trip, your story, your gear and those bikes! Lookin good girl!! Two thumbs way up!!! Love love love the weekender trips! And you look great in the photos! Keep it up!! !